For several decades, Kansas Citians flocked to the King Louie West entertainment center on Metcalf Avenue in suburban Johnson County for bowling, ice skating and billiards. Designed in two phases by architect Manuel Morris, the center’s distinctive Googie architecture captured the mid century modern design style popular at the time. Flash forward 50+ years, the iconic entertainment center was shuttered and the building in disrepair. Seeking a new home to house the Johnson County History Museum, along with other programs, the County purchased the 76,000 SF building to create a new hub for arts, culture and community. Though the building had fallen into disrepair, its structural systems were beautiful and completely sound. 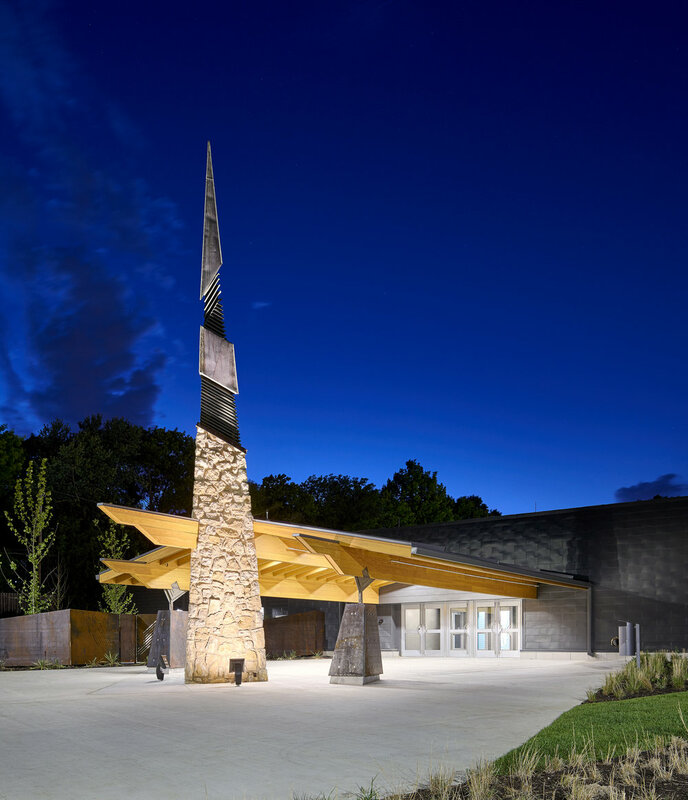 Featuring long-span trusses in the former bowling alley and impressive glulam and timber structural decking in the ice rink, the building was well suited to the needs of a contemporary cultural arts center. 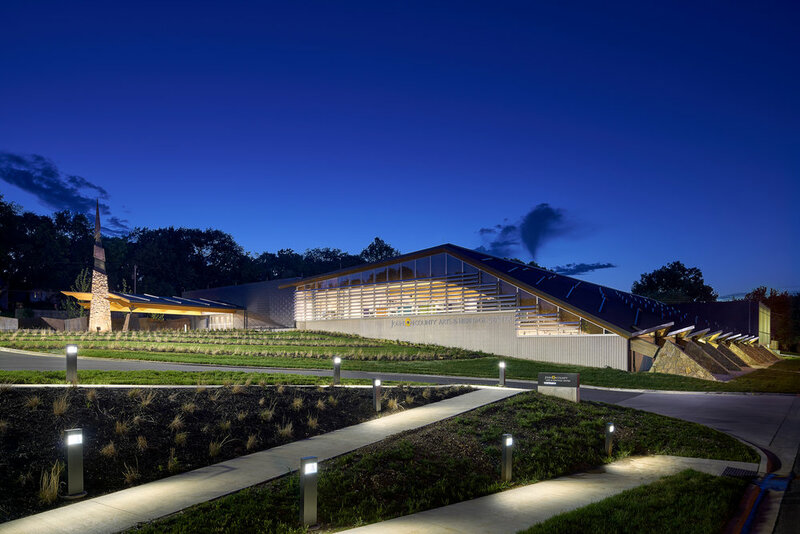 The steep fully-paved site and the building’s exterior envelope were redesigned to meet contemporary energy conservation goals, utilizing a combination of the building’s existing stone and wood and introducing cast-in-place concrete, insulated glass and flat-seam metal paneling. Acknowledging that true historical restoration was neither appropriate nor feasible, the design enhances the original building design by emphasizing what is beautiful about the building - the glulam roof structure, the limestone thrust-blocks, the porte-cochere and entry spire, the trapezoidal window openings to the billiards hall - and replacing the features that no longer function. By replacing nearly the entire south façade with shaded glass, views into the impressive vaulted former ice rink space were achieved, providing an upgraded façade welcoming the community into the space. A multipurpose event space and adjacent outdoor courtyard, flex theatre, rehearsal studios and office space now occupy the former bowling alley. The Johnson County Museum, including exhibits, the famed All-Electric House and gallery space, are featured in the former Ice Skating Rink. Arts and dance classrooms, as well as additional office space, now occupy the former Billiards Room. A cultural commons through the middle of the building connects the various spaces and provides pre-function space as well as space for community events, exhibitions and other cultural programming. High impact graphics throughout pay homage to the former uses of the space and help to achieve the “wow” factor desired by the client.